Well, would you look at that. It seems 70’s bohemia styling is really having a moment right now, we celebrated all things floppy hat and floral crown in our Sunshine State Of Mind shoot and it seems dress designer Dana Bolton is also embracing the aesthetic. And beautiful gowns, Dana is definitely embracing beautiful gowns. Her latest collection of six unstructured yet luxe pieces is exquisite and deliciously photographed in the June sunshine by Kirsten Mavric. There is a plethora of hair and make-up inspiration as well as some super pretty bouquets and headpieces, I am expecting a veritable pin-athon this afternoon lovelies. And if you are a redhead? LOVING the subtle soft green eyeshadow for W-day as seen on model Victoria. Do let us know which is your favourite dress and if you are tempted by any of the styling ideas in the feature. I want that veil more than cake. 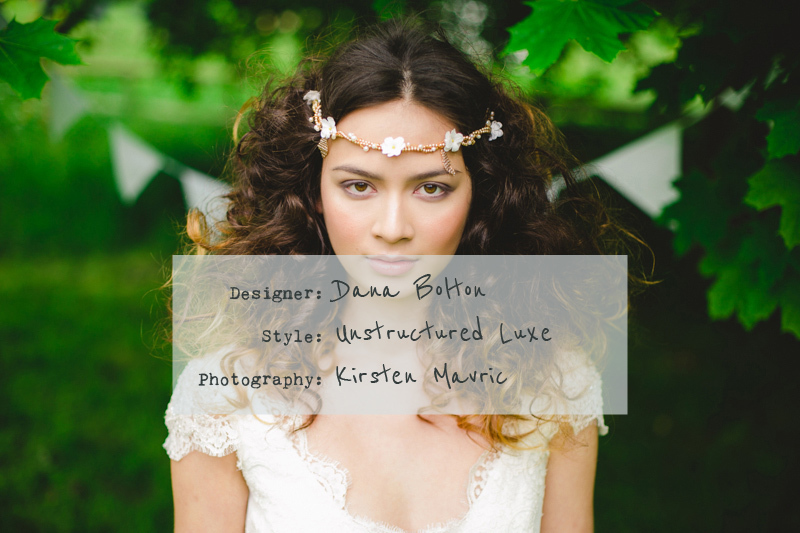 Dana Bolton: I am, unashamedly, a complete lover of all things beautiful, bohemian and preferably expressed through beautiful dresses. This dress collection, small as it is, offers, I hope, something a little different for brides. The dresses here, I would like to think, offer inspiration to brides looking for a feminine, unstructured but still luxurious, very special dress. Inspiration for the new dresses – I had in mind a feeling, very clear, of romance and natural beauty. 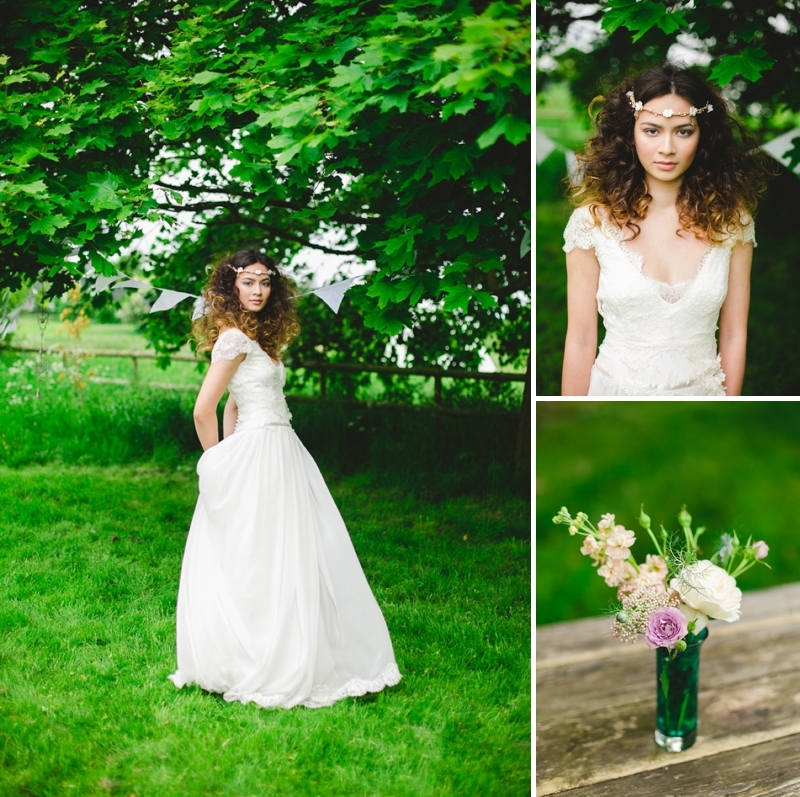 That and a dash of mid summer magic, trying not to get too swept away on a cloud of whimsy, though we kept the styling quite minimal, concentrating on the dresses, the beautiful models, flowers and hairpieces, oh! and a field of June flowers in a magical rural location. Organising the shoot as well as the dresses was an amazing pleasure for me. For the photography, I knew that I wanted to work with Kirsten Mavric on it. 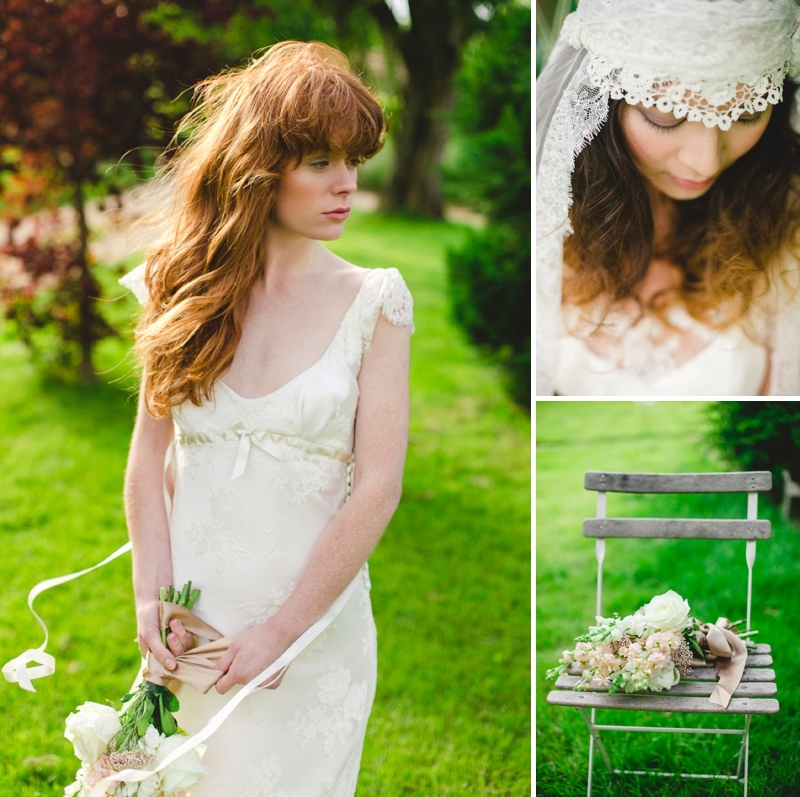 We’d worked on a shoot before and I adore her photography, that and the fact that she has impeccable taste! I trust her completely to create gorgeous images. 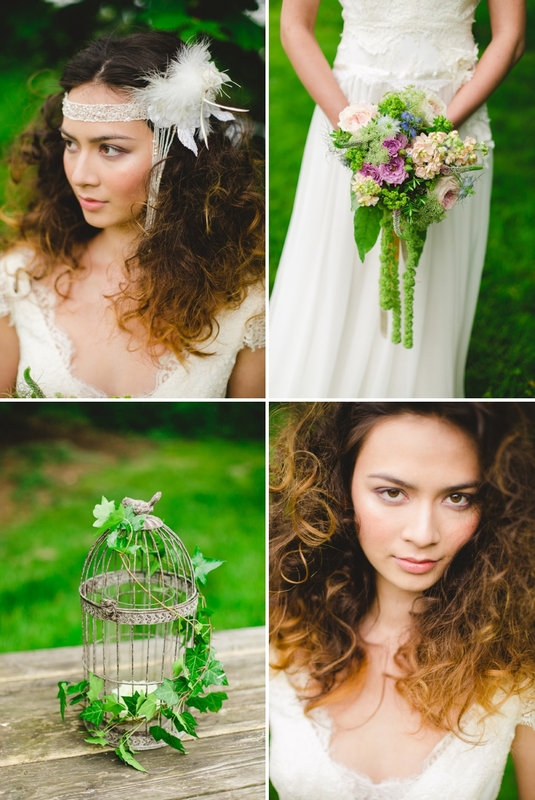 Donna Crain created a beautiful Boho Chic hairpiece especially for us. This can be seen worn with the Clara dress, a wonderful piece with side detail of flowers and feathers and beads. Donna also supplied the very, very pretty gold tone daisy head/forehead band also worn with the Clara dress. 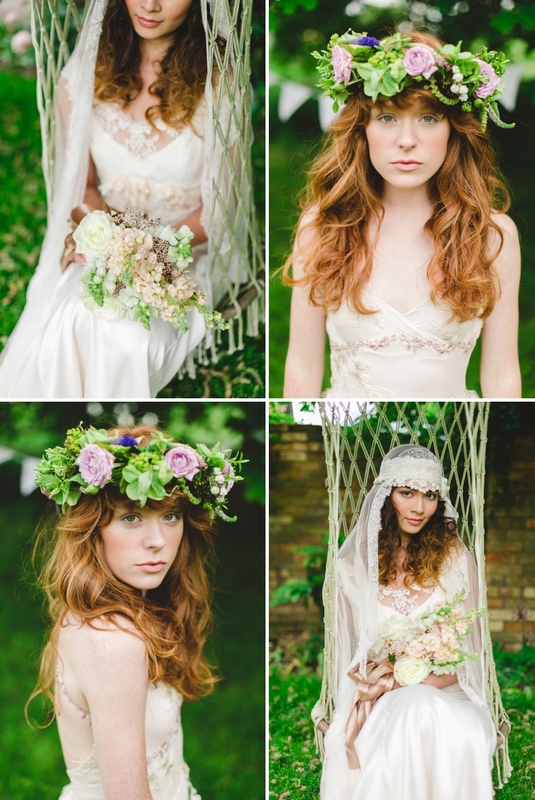 Liz Jones at Blue Sky Flowers created a Floral crown that just took my breath away. It was simply just right! A little bit wild and pagan, contained and very beautiful. Liz also made the two bouquets,and floral posies. 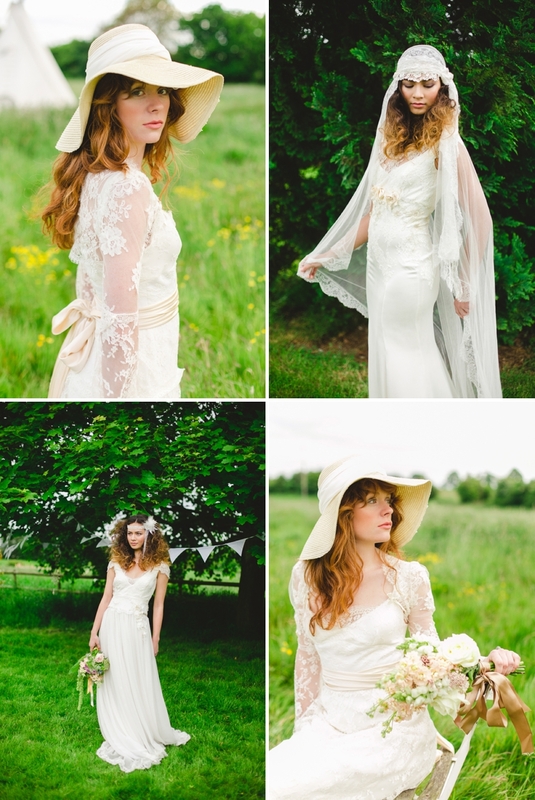 Inspiration came from a definite line of iconic early70’s muses Biba, Stevie Nicks, wafting around in meadows of long grass with a floppy hat ….that kind of imagery came to mind. That and a touch of mythology with the Felicia dress looking a little elemental! Well it was almost mid-summer. It really was such fun sourcing the details, some of my best finds came from garden centres. Jars for flowers/candles, hanging decorations for trees, bird cages and much more. The dresses we shot were a mixture of three new pieces and three from the existing collection. I can, and almost always do, offer bespoke versions of the dresses. “Clara” worn with the fabulous hairpieces from Donna Crain, has a hand crafted bodice with layers of applique lace and 3D flowers made from the same lace. The shape, having a dropped waist, is so very flattering, a little bit 40’s, a shape used extensively in the early 70’s by the likes of Ossie Clarke, don’t get me started on Ossie! A 40’s shape is flattering but has to be treated carefully and delicately as it can look a bit frumpy sometimes. The low neckline and neat beaded cap sleeves add glamour. The skirt is edged with a delicate lace trim. “Flora” is a real mixture of sensual textures and details. The fabric is ivory sand washed silk that feels like peach skin! The lining is an apricot silk that glows through gently, barely there but adding a mysterious two tone effect. The cut is empire line and figure hugging. The laces are all appliqued on and follow the shape of the body to the hip area. I have used a variety of laces to build up the multi textured effect. The hand crafted flowers under the bust use the peach under silk and laces. This dress is worn with my first foray into the world of veil making. 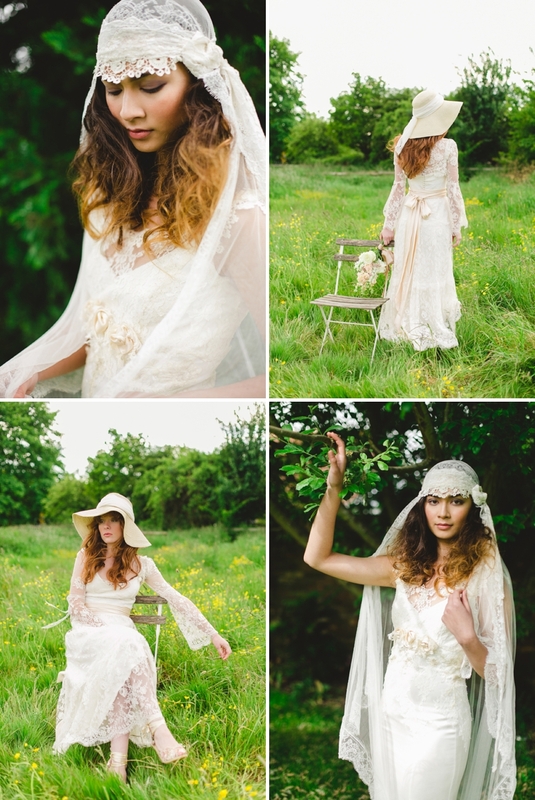 The angelic vintage look veil is of silk tulle edged with a fine lace trim. The head piece is separate and can be worn alone. I used three different very delicate genuine vintage laces for the headpiece, this is where the Biba inspiration came in! “Felicia” was a complete indulgence to make. I did not have my sensible hat on here at all! Hand dyed blush pink, the name came from a story illustrated by Kay Nielsen (turn of the century illustrator) called Felicia and the Pot of Pinks. The title just sticks in my mind. A backless slip of a dress with gold tone applique and bush pink flower lace trim. I think I had a romantic notion of an elemental mid summer nature sprite in mind ! Worn with the beautiful floral crown that Liz from Blue Sky Flowers made. “Aurelia” and “Odessa” were shot together, we added a floppy hat to the look for Odessa. These are adaptions of the original designs in my collection, tweaking the designs a little. Aurelia has layers of georgette falling in handkerchief points. Odessa which has a tiered lace classic seventies look, has a separate lace jacket with fluted sleeves. 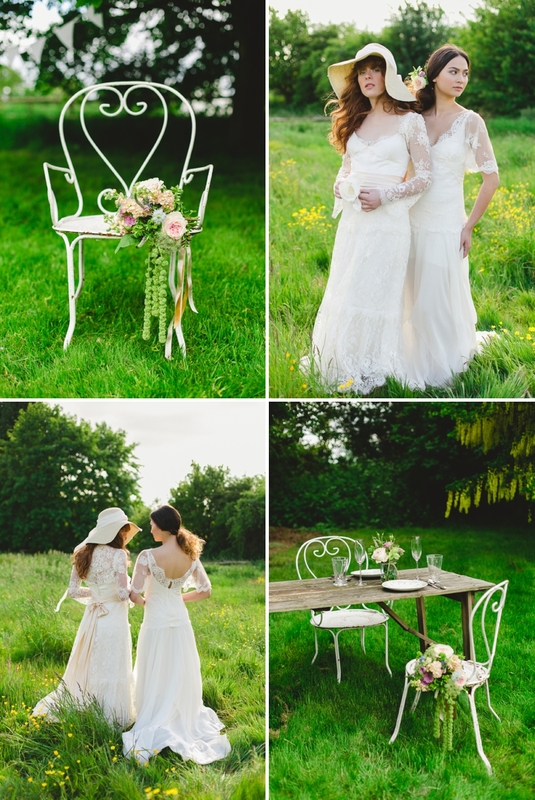 These two designs both express a relaxed bohemian ethos, using some very beautiful French laces and silks throughout. 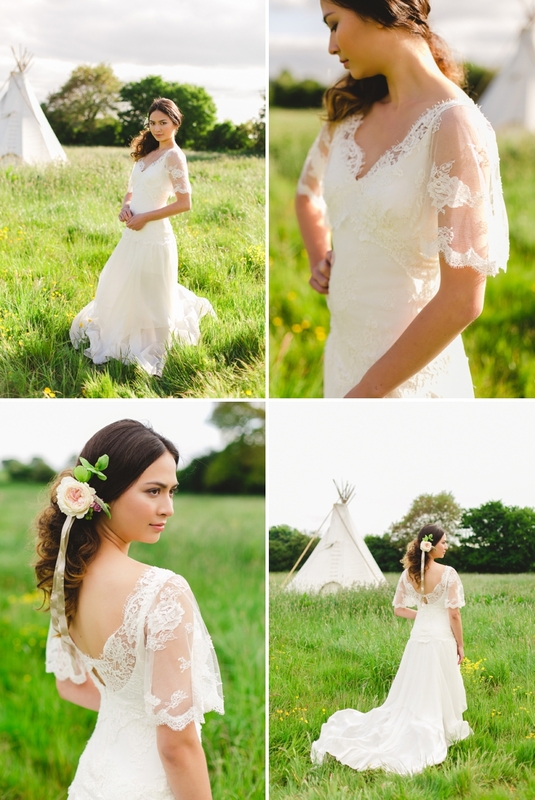 The last dress that our model Victoria, who I swear grew more beautiful as the day went on, wore was “Sofie”. Again this is a variation of the original in my collection. Sofie is a simple sweet dress in French Lace with an empire line and ribbon detail. There is feminine charm, I think, to this design that has a bit of a wow factor with the low back. I bought myself a floppy hat with a dash of green ombre from H&M a few weeks ago, all I need now is a floral crown and THAT VEIL. My favourite frock is the Flora if anyone is interested and I am now inspired to dine al fresco more often now the weather is getting gradually warmer…any excuse to put pretty blooms on a table and light some candles.